How Big Of A Winch Do I Need? So you need a winch for your off-road vehicle, because you never really know what your Jeep or 4×4 can do until you push it too far. There is no definitive guide on what kind of mud your customized vehicle can handle, so the only way to know for sure is to experiment. And you can’t properly test the limits without getting stuck a few times. And that is when you need a quality winch. There are a ton of different electric winch models on the market, and they all come with different strengths, weaknesses, and tolerances. That’s why we’ve reviewed three of the top truck winches that deliver the best bang for your buck. And in our estimation, the Smittybilt 97495 is the cream of the crop. 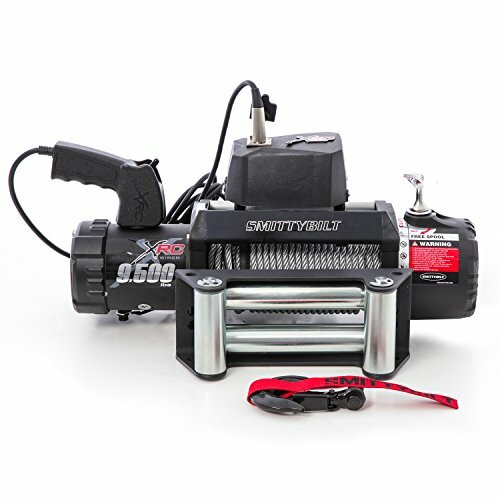 This excellent winch had the right combination of features and price to gain our top spot. But the other winches in our roundup excel in various areas, so depending on your needs you might find a more suitable winch. Read on to find out what sets these great winches apart from a crowded field of competitors. 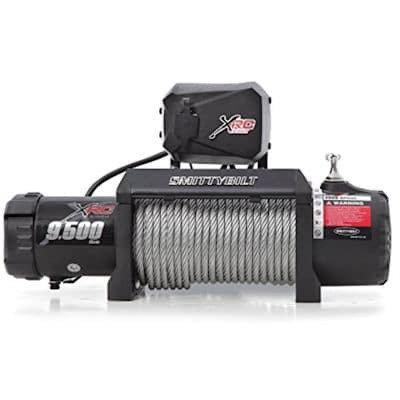 Our top choice as best electric winch for the money has to be the Smittybilt 97495 XRC Winch. This rugged power winch boasts a pull strength of 9500 pounds – more than enough to haul your Jeep Wrangler or truck up out of the muck. The XRC has an amphibious motor rated at a monstrous 6.6 horsepower, and a planetary gear system that translates that horsepower into raw pulling strength. Did we mention that it is an amphibious motor? As in waterproof? You need that in a good winch, because a key ingredient in any mud hole is water. That is why the Smittybuilt XRC’s design encloses both the motor and gear system, keeping the wet out and your hopes of getting out of the mud alive no matter how deep you sink. And the XRC’s corded remote gives you a good shot at operating your winch without having to tread water at the same time. 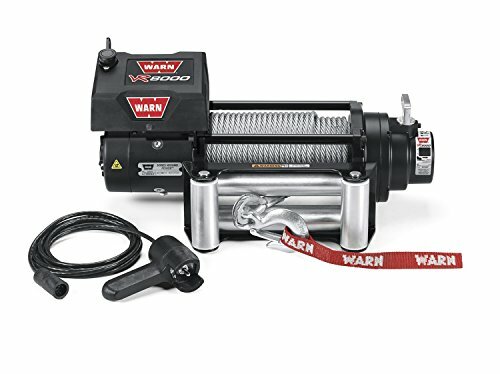 This exceptional electric winch has over three hundred 4-star and 5-star reviews on Amazon, and is one of their best selling models. Users rave about the exceptional pulling capacity of the XRC, and many also comment on the winch’s straightforward installation. More than a few give testimonials about how this best-in-class bumper winch got them out of sticky – and muddy – situations. Despite all of that, there are some tough competitors going up against the Smittybuilt 97495 in this category. One of the things that pushed it into our best winch for the money top spot is the price. This fantastic off-road accessory can be had for under $300. At that price, there is no reason not to have a Smittybuilt on your Jeep or 4×4. Kit comes complete with all wiring required for installation. Smittybilt recommends using supplied wiring. 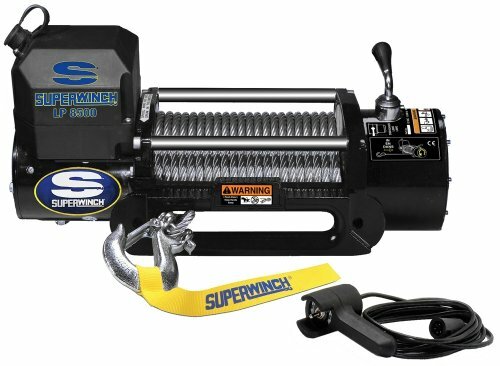 A well-rounded array of features garners the Superwinch LP8500 Gen II our #2 spot for best truck winch for the money. It’s obvious a lot of thought went into designing this 8500-pound winch, as evidenced by features like a 4 1/2 horse sealed series wound motor coupled with an all metal, heavy duty three-stage planetary gear train to make the most of those horses. Even though it has a little less pulling power than our #1 pick, it still has plenty of yank to get your mudder moving again. There are other features on the LP8500 that you will be thankful for once you have to use it. It sports 94 feet of 5/16″ steel rope cable, which will give you plenty of slack to find something to latch onto. And the hand-held winch remote with a 15-foot cable means you won’t have to stand in the water while the Superwinch does its job. Eighty-five percent of the folks that have reviewed the SP8500 have given it a four or five star review, and that’s with well over 100 folks taking the time to write about it. And one theme that recurs in the positive reviews is ease of installation. That’s a plus, because many of us who like to puddle-jump off-road aren’t full-time mechanics. 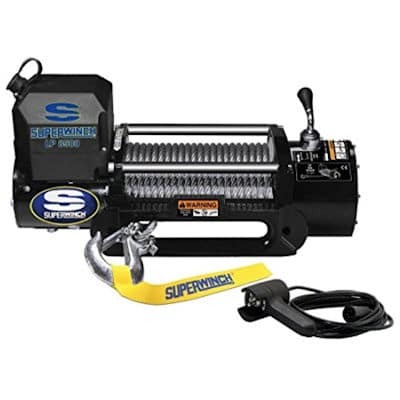 Like our #1 pick, the Superwinch LP8500 Gen II comes at a great price. If you are looking for a nice entry-level electric winch with some features that don’t typically show up until you spend a lot more, the LP8500 might be just what you are looking for in an affordable winch. 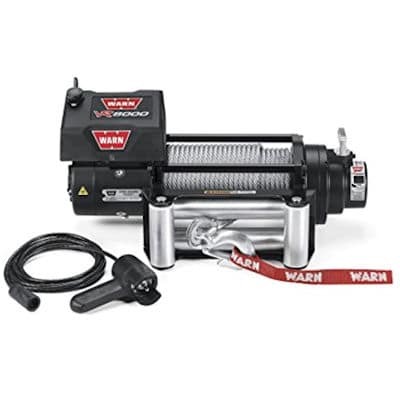 Our #3 pick for the title of top electric winch for your money is the WARN 86245 VR8000. Warn is a name synonymous with high quality winches, so to find one in a value roundup like this is a little surprising. But the features Warn packed on the VR8000 make it a great entry-level choice for lighter trucks, Jeeps and SUVs. The 8,000 pounds of pulling power from the VR8000 is the least of the three competitors in this review, but it is still more than enough gumption to get a Jeep or light SUV out of most mud holes. Like the Superwinch in our #2 spot, the Warn VR8000 comes with 94 feet of cable and a 3-stage planetary gear train. It also has a corded remote to keep your feet dry, although the Warn remote cable is 3 feet shorter than the Superwinch. Another nice feature on the VR8000 is a removable control pack that can be mounted elsewhere on the vehicle. That allows you to control the unit from a place of your choosing. And like higher end Warn units, the VR8000 comes with their proprietary synthetic Spydura rope. Like our other top pics the VR8000 garners a lot of positive feedback online, with most celebrating the fact that they got a quality Warn winch at an affordable price. Even though it comes in a little higher priced than our other two picks, that is to be expected from a brand like Warn. When considering the best off road winch for the money, one question you should ask is how much winch power is enough for your truck or Jeep? The industry rule-of-thumb is to multiply the gross weight of your vehicle by 1.5 for a minimum rating. In real-world situations, however, there’s a lot more that goes into deciding what size winch is best for your rig. Where And How Will You Use Your Winch? How you use your recovery winch and what type of terrain you encounter will influence how much winch power you need. For pulling vehicles out of the mud, you’ll need a lot more winch power than if you use your winch to pull a rolling load on flat, stable terrain. The “sucking” force of mud and sand demands a lot of power from your winch. Heavy mudders will need a winch rating at least 2 times the gross weight of their truck or Jeep. And that’s just the minimum. Incline matters, too. For steep grades, you’ll need more winch power. For steep hills, mountainous terrain, and pulling a load up a ramp, you’ll need to consider a larger winch size. How Frequently Will You Use Your Winch? If you use your winch frequently, you should choose a larger winch size. The harder your winch has to work, the faster it will wear out. A more powerful winch motor will not have to work as hard to pull a load. Although you might need to “max out” your winch once in awhile, it’s not good practice to use the full capacity on a regular basis. The strain on the motor will wear down your winch quicker than if you purchased a more powerful winch. Recovery winches are rated based on the first layer of winch cable (closest to the drum). To reach the full capacity of your winch, you’ll need to spool out enough cable so that only one layer is left on the drum. If the distance between your recovery winch and the load you’re pulling is too short to spool out enough cable, you may need to rig up a double line pull. If you expect the winch line to hold weight without creeping under heavy loads or on steep angles, be sure to get a winch with both mechanical and dynamic braking. Every winch includes a dynamic brake, which is an automatic in-the-drum braking system. Some winches also include a mechanical brake, which is a physical brake that works similar to the brakes on your car. If you winch at steep angles, under heavy loads (close to the max winch capacity), or with a snow plow system, we recommend getting a winch with both dynamic and mechanical braking. The mechanical brake will hold the load better and prevent slipping. Which Is Better – Synthetic Rope Or Steel Cable? The debate is hot between synthetic and steel. Some guys swear by synthetic winch rope for its safety, lightness, and strength. 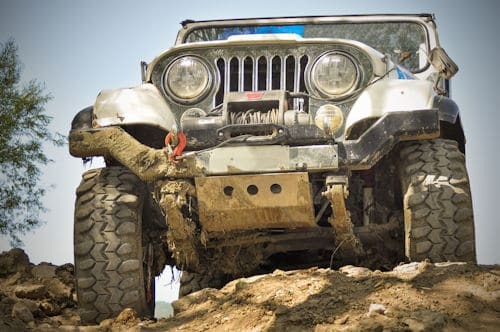 Others prefer steel cable for its long history in the world of offroading. Both types of winch line have their strengths and weaknesses. Synthetic cable is lighter and more flexible than steel cable, floats in water, won’t slice your hands with burrs, and can be easily spliced, among other benefits. Steel cable requires less maintenance, retains its circular properties under tension for neat and easy spooling, and has a long history of use in off road situations. Should I Use A Winch Mounting Plate? The safest and most secure way to mount your winch is to use a mounting plate. You can purchase either a universal mount plate or a custom mount plate that is designed to fit your vehicle. You also have the option of a multi-mount winch plate that allows you to move the winch from front to rear. If you choose not to use a mount plate, you must mount the winch to a flat, secure surface that is able to withstand the pulling force of the winch. Check pricing on winch mounting plates. Do Winches Need Maintenance And Repairs? Offroad winches require very little maintenance. Keep it clean and dry with a winch cover to prevent corrosion and damage from the elements. Check the winch cable before and after use for any signs of damage. Clean the cable after use and allow it to dry before respooling. Check the tightness of the electrical connections and mounting bolts every few months, and remove any dirt or corrosion from the connections. If your winch has been repeatedly exposed to harsh conditions, you may need to take it apart every so often to clean and re-lubricate it. A harsh grinding sound in the motor is one indication that your winch needs to be cleaned and serviced.